Don’t let your guests’ hearts turn to steel! Calm their spirits and help them relax with a tasty beverage when you give them Pittsburgh 2 Drink Tickets at your next Allegheny County event. 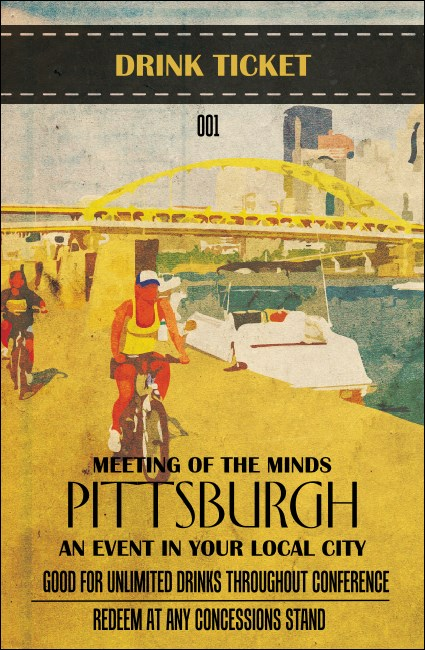 With a background that shows bicyclists taking a ride down Heritage Trail near the Fort Pitt Bridge, these tickets will help you win your guests over! Keep your event above water in the City of Bridges at TicketPrinting.com.